Are you like The Movie Mind? 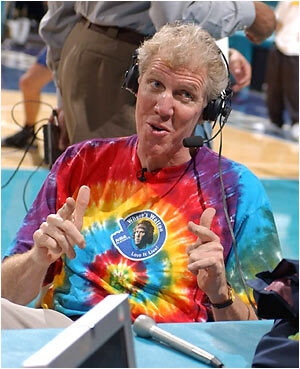 I used to avoid watching an NBA game if Bill Walton was doing the commentary. I loathed him to a point that I did not think I was capable of. I would literally watch a game on mute instead of having to listen to his incessant ramblings that made me think he must have been tripping on ‘shrooms when he said it. Then, a funny thing happened: I learned to embrace it. I started actually listening to the things he said and treating them like a bad rewrite of another Airplane sequel. I eventually found him hilarious and watching a game without Bill Walton’s commentary just did not feel the same. This list is a tribute to those famous “Walton-isms” as a way for The Movie Mind to make amends with him. Thank you, Bill, for these classic little nuggets that speak so much more than just about the game of basketball. This list has been compiled over some time and is intended to serve as the “Unofficial-Official Database of Bill Walton Quotes.” As comments are added and more quotes occur, the list will be continually updated. Your search for commentarial bliss has ended here…courtesy of The Movie Mind! I miss Snapper slapping down Walton’s periodic assinine comments. I would respect Bill’s opinions more if he didn’t contradict himself and mention Western civilization so often. The best post i have ever read. Bill Walton is the most egregious commentator in the history of western civilization. Movie Mind, you’re a genius. This is a great post that was quickly passed along to all my friends. I miss Walton in the finals- luckily ABC cuts to him in the crowd from time to time. They just made those decisions. That they were going to break all the rules of human decency. After pleading for Kevin Garnett to come back in the game, Walton seemed almost sad that Semih Erden was checking in instead. Pryzbilla does what he does best… violate the rules. His commenting was so terrible and goofy that it literally erased Bill Walton’s basketball career from NBA history. He was one of the best players of all time, and nobody remembers it at all. All they know is that he screwed up games with head scratching comments and goofy outfits. WaLton is freakin halarious, he tells it like it is, with a a little off the wall stuff. Bill Walton is the greatest commentator ever. After a blown call from a referee, Bill – “The continual deterioration of officiating in the NBA is…one of the great American tragedies”. This was Dalembert made a basket. Why is the Sabonis one funny? Sabonis was a living legend and did become a HOF’er. I loved Walton doing the FIBA Tournament of the Americas. He talked about politics, history, poetry, world events … but very seldom basketball. Tour de force, makes the weird stuff he is doing now look tame. I guess no one was watching. I loved once when he was doing a Wizards game and Tyronn Lue shot an airball on a layup, he said “If ONLY Larry Hughes could have recognized that magnificent alley oop pass from Tyronn Lue.” The entire play was awkward and Hughes was at no angle to receive a pass and score. His sarcasm is killer, deadpan, like a basketball Bill Murray.